Borneo's Sabah is one of the most beautiful corners of the world, endowed with far more than its fair share of natural wonders and a spectacular backdrop for a bit of an adventure. This is also a spectacular place to relax, and some of the best places to stay in Sabah take advantage of their idyllic surrounds. These are found at all points along the price scale from guesthouses in the mountains to luxurious resorts right on the water. The best places to stay in Sabah lie on an island off the coast of her capital, Koto Kinabalu. There's beauty from top to bottom: from the peak of breathtaking but achievable Mt Kinabalu, to the beautiful reefs under the water level - suitable for beginners as well as experienced divers. Sabah's natural beauty doesn't stop with the landscape, Sabah is home to one of the world's best orang-utan rehabilitation centres, where you can see these ginger fellas having a whale of a time in their natural habitat. Sabah is also home to the charming doe-eyed loris and some of the world's most colourful butterflies. Just off the coast are a number of islands known as nesting grounds for hawksbill and green turtles. Sabah's capital Kota Kinabalu is colourful, with plenty of great places to eat and some fun markets. But there are plenty of fun smaller centres to consider as well, if you're looking for a quieter retreat. Sabah also has a number of rare plant species - and pretty spectacular ones at that! On the slopes of Mt. Kinabalu you'll also find an impressive orchid garden which is also home to the raffelisa flower - the world's largest bloom, capable of producing flowers up to a metre in diameter! Then there's the beaches and islands off which you'll find some of the world's best diving and snorkelling - the Tunku Abdul Rahman Marine Park boasts sea turtles, reef sharks and manta rays. The beaches themselves are beautiful too. Even the ones populated by cheeky monkeys trying to steal your lunch. Hike to the top of Mt. Kinabalu and drink in the spellbinding scenery! Check out the markets of the capital, Kota Kinabalu! Head to one of the orangutan rehabilitation centres and say hi to your ginger-haired primate cousins. Lounge at the beach with a good book! Our pick of the best places to stay in Sabah all boast proximity of beautiful sandy beaches and are ideal whether you're booking your honeymoon or a family holiday of a lifetime. The Gaya Island Resort is a collection of fantastically canopied rooms and suites set in amongst the mangroves and rainforest, right beside its own private beach. This is a great place to bring your family to experience some of the wonders of Sabah's rainforests - there's excellent birdwatching within the grounds of the hotel. There's also a luxurious spa, a good seafood restaurant and a kid's club. The Gayana Eco Resort is an eco-resort associated with a marine research centre, so as well as enjoying wooden villas on stilts which hover over the aqua sea below, you're helping to fund local marine research. 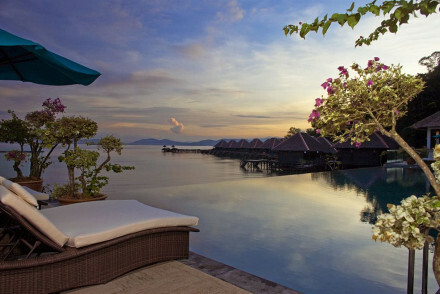 There's also a dive school and a fabulous spa and a very good Malayan restaurant. Bunga Raya is another collection of wooden villas on stilts, sitting out over beautiful waters and surrounded by jungle and white, sandy beach. This is the perfect honeymoon spot, with luxurious suites and villas, a 25 metre infinity pool and an excellent malayan restaurant. Fly to Kota Kinabalu International Airport and get a ferry to Pulau Gaya island. Go between January and March, when the temperature ranges between 23 and 32 degrees. Fantastic canopied rooms and suites set amongst mangroves and rainforest with its own private beach and pontoon. Luxurious Village Spa, fresh seafood restaurant, and chic suites with all the mod cons. Kids club too. Perfect for a beach paradise, romantic, and family friendly. Birdwatching - Rainforest surround the hotel, and plays home to many birds and wildlife. An eco resort with wooden stilted villas that hover over the aqua sea below. Luxury sophisticated interiors with all the mod cons, including DVD players. Some interconnecting rooms. Marine research centre, diving school, fabulous spa, and excellent Malay restaurant. Families and nature lovers. Eco - Ecology is at the heart of this resort.